With a Massey BA (Māori Studies) you’ll become an ambassador of Māori knowledge, and the contribution it can make to problem solving the challenges faced by and within global societies. An understanding of Māori language, culture and Te Tiriti o Waitangi is key to shaping the social, political, and economic future of our nation. With te reo Māori, Te Tiriti o Waitangi and human rights competencies you’ll be able to engage with a range of social, cultural, economic and political structures and processes as an agent of positive Māori development. You’ll acquire important connections that will enable you to demonstrate your social responsibility toward Māori and human rights, in ways that are respectful of communities, the environment, and wider society. Your BA (Māori Studies) will give you the opportunity to apply your knowledge across a range of areas, for example, education, health, research, policy and whānau, hapū, iwi and community development. Learn from staff who care about you! Our Māori studies programme has passionate staff who are themselves, agents of positive Māori development and closely connected to their own communities. They care about your learning journey, and take their responsibility for helping you very seriously. Learn with us, and we learn together. Studying the Treaty of Waitangi and writing assignments on Māori language, health and politics don't sound like the way most professional rugby league players spend their free time, but that was my reality. 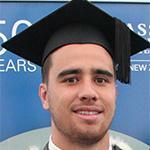 I studied by distance at Massey University while pursuing a professional sporting career as NRL league player for the Parramatta Eels in Sydney. Over the last five years I was in Australia playing professional rugby league and have come back to join the Vodafone Warriors in Auckland. It was quite tough at times being away. I’d grown up in a very Māori world, at school and home. It was a big change of lifestyle and I missed being around the language and customs, the big gatherings with powhiri. My study definitely helped me keep in touch with my culture. It’s good to have a balance in life with study, sport and family. With the training all day, it was good to use my brain. My parents are both teachers and they always instilled in me the value of education. One day I might consider training to become a teacher, but for now I’m concentrating on my current sporting gig with the Warriors.